Welcome to Certified Automotive Repair! At Certified Automotive Repair in Salem, OR, we continually invest in new and innovative tools and technology to stay up-to-date with industry standards. With the latest in diagnostic tools, we’re able to accurately answer questions and help get our customer back on the road quickly. You no longer have to go from shop to shop searching for a direct answer regarding your vehicle. We are dedicated to our customers, honest and upfront, and have the skills and experience to get the job done right. No matter what kind of vehicle you drive or where the road takes you, we can make sure your ride is smooth and reliable for miles to come. Every auto shop is different, but we know what it takes to be your trusted team for providing maintenance service or repair when unexpected breakdowns occur. Life happens, and we are here to help you get back on the road in no time! Our technicians are hand-picked and expertly trained. They have their Automotive Service Excellence (ASE) Certifications, and we provide ongoing industry training on top of that. Our goal at Certified Automotive Repair is to maintain the best auto repair technicians in the business, so you never have to concern yourself with quality! The Certified Automotive team has decades of combined experience, which has earned us the reputation of your preferred Salem, OR automotive repair shop. Whether it’s routine maintenance, engine repair, tune-ups, or diesel repair, Certified Automotive has got you covered! Our goal is to get you on the road quickly, with the quality in maintenance and repair that you deserve. Certified Automotive Repair has worked hard to provide our clients with a top of the line facility in Salem, OR. We are always looking at new technology and innovative tools to be as quick in our service as possible without compromising accuracy and quality. Our goal is to get you back on the road with as little downtime as possible and to earn our clients trust. Come in for a tune up and check out our facility. We guarantee that’s all it will take to keep you coming back. The Certified Automotive Team in Salem, OR is ready and waiting for your call! You can schedule an appointment online, or give us a call at (503) 917-3143. We offer full-service auto repair on all types of cars and trucks, so you can be sure to get the service you need. Whether it’s a car inspection, brake service, check engine light… you name it! We’ve even got a diesel mechanic on staff. We want Certified Automotive Repair to be your one-stop auto maintenance and repair shop now, and for years to come. 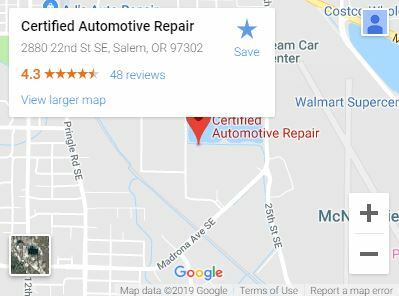 Call the name in auto repair you can trust, Certified Automotive Repair in Salem, OR. Don’t take our word for it ….